Transfection, the delivery of nucleic acids into cells, is the core technique for enhancing or inhibiting gene expression, or for initiating the expression of nonnative proteins in host cells and organisms. Surrounding this core technique are myriad elaborations, refined approaches suited to different research and production settings. Several companies have been looking for ways to improve transfection for scientifically relevant cells, including primary cells, neurons, stem cells, and immune system cells that have traditionally been difficult to transfect. For example, Thermo Fisher Scientific recently announced the launch of Lipofectamine MessengerMAX, a transfection reagent for mRNA delivery. 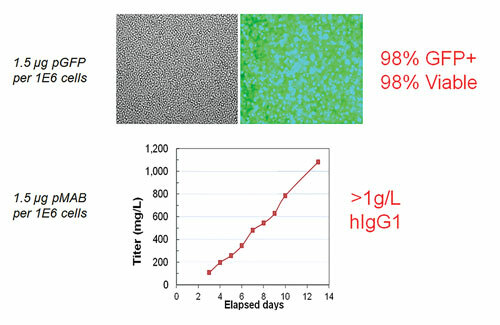 Adherent CHO cultures complicate the design of transfection reagents and vectors; high-density suspension cultures pose even more difficulties. “There’s a lot of development ongoing around conditions, culture media, and enhancers for sustaining super-high-density cells for maximizing protein-generating productivity,” Dr. de Mollerat du Jeu adds. For early-stage development work, even for products that will eventually be manufactured in CHO, companies often turn to transient transfection of non-CHO cells to generate research quantities of recombinant proteins. Several vendors have products for transient transfection of HEK 293 cells, for example. Last year, Thermo Fisher launched one such product, Expi293, which attains g/L titers. But there is much to be said for sticking with one cell from development through manufacturing. Post-translational modifications differ significantly among species and can significantly affect a protein’s biological activity and quality. Originally developed for cell therapy, electroporation has become a go-to method for transient and stable transfection of bioproduction-worthy cells. James Brady, Ph.D., director for technical applications at MaxCyte, notes that by virtue of its scalability, electroporation eliminates low protein yields that are characteristic of reagent-based transient transfection. One would think that scaling instrument-based transfection would be more difficult than with reagents in batch mode. “Transfection reagents are quite expensive, so at large scale the cost may be prohibitive,” Brady notes. “Plus reagent processes optimized at small scale do not always translate to large scale.” For example, mixing of reagents with DNA and reagent entry into cells can differ significantly at various scales. Because of CHO cell dominance in the biomanufacture of antibody drugs, MaxCyte maintains a sharp focus on this area. One of the company’s instruments, STX, transfects up to 20 billion CHO cells at 95% transfection efficiency and high viability, according to the company. The VLX instrument handles up to 200 billion cells, which can lead to gram quantities of protein. “And it’s a lot faster than stable transfection,” remarks Dr. Brady. Using transfection to silence genes implicated one way or another in cell-line productivity can provide cell- and genome-level insights. It can reveal the inner workings of cells that express therapeutic proteins. Susan Sharfstein, Ph.D., a professor of nanoscale science and engineering at the State University of New York, Albany, has used nanoparticle-based transfection in mammalian cells to shed light on how process conditions affect cell physiology and protein productivity. But this sort of probing is rare in biopharmaceutical development. Instead, there is ever-greater emphasis on media and feed as productivity enhancers. Transfection tools used to improve production cells are applicable to other areas of investigation. For example, they may be used to generate cell-based assays to support drug discovery, medical diagnostics, and basic research as well as biomanufacturing. Interestingly, the issues surrounding transient versus stable transfection apply across disciplines. Recursion Pharmaceuticals, a small molecule pharmaceutical discovery and development company, combines high-throughput gene knockdowns to create disease models in cells. “Instead of building an assay for a specific disease, we have built an assay that lets us query thousands of diseases,” says company CEO Chris Gibson, Ph.D. 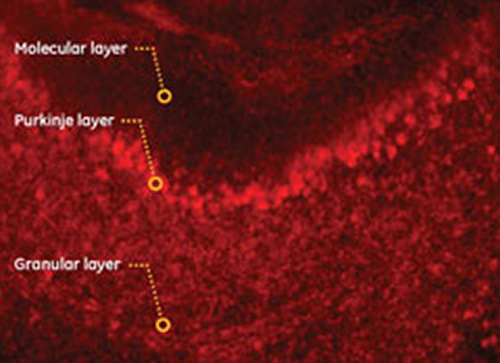 This approach provides a broad readout composed of general changes in cell structure. Recursion uses RNA interference (RNAi) or CRISPR/Cas-9 gene editing. Similar technology might be used to create super-CHO or HEK cells that stand up to high recombinant protein or metabolite concentrations; are immune to fluctuations of temperature or dissolved gas levels; or produce more robustly. Whether Recursion pursues transient or stable transfection depends on the circumstances. Transient RNAi transfections are satisfactory when assays can be carried out relatively quickly, or when stable transfection disrupts a cell’s genomic machinery to the point where it dies or fails to grow. “If there’s no way to achieve stable knockdown, then transient is the next-best approach,” Dr. Gibson tells GEN. Similar issues have caused delays in selecting robust, highly productive CHO and HEK cultures through stable transfection. GEN’s readers are familiar with transfection for purposes of adding genes that code for therapeutic proteins. The application of transfection in functional genomics for drug discovery, analysis of regulatory RNAs, and pathway analysis has become equally important. The exploding interest in knocking down genes via RNAi has in particular been a boon for transfection technology and vendors of related products and services. “Oligonucleotides are only useful if you can get them into the cell to do their job,” notes Louise Baskin, senior product manager at Dharmacon, which specializes in gene expression, gene editing, RNA interference, and RNA oligonucleotide synthesis. Dharmacon has been part of GE Healthcare Life Sciences since March 2014. For the expression of protein therapeutics, transfection makes accessible not only productive sites where one or more copies of protein-encoding genes might reside, but also the ability to stably knock down factors that may reduce or inhibit protein production or diminish quality. A similar approach may be taken to knock out genes involved in pathways that cause a tumor suppressor gene to be over- or underexpressed. Whether transient or stable transfection is used depends on the goal. Groups that desire stably transfected cells for biomanufacturing might begin development in transiently transfected cells to see how cells hold up or to harvest a few grams of protein. Still, more often than not, such groups will eventually decide to stably transfect using one of several plasmid platforms. Stable transfection also makes sense for cells destined to serve as hosts for cell-based assays, where multiple generations are needed. “It’s easier to pull these cells out of the freezer than to transfect them all over again,” Baskin advises. Similarly, assays that take longer than the knockdown duration of small interfering RNA (siRNA) require stable transfection. For example, if treatment or toxicology is to last many weeks, stable transfection may be needed. But transient transfection is easier and takes less time. Also, there are times when transient transfection provides an answer that is as good or better than stable transfection. Still, transfection technology has its limits. For example, transfecting certain cells, such as primary neurons and suspension cells, remains difficult through cationic lipid and viral vector techniques. Dharmacon claims its Accell siRNA reagents are different. “The RNA strands are synthesized with a modification pattern that enables the siRNA to self-deliver into even difficult cells,” asserts Baskin. Moreover, transient gene silencing, whether for research purposes or to guide cell-line development, may be extended with Accell siRNA simply by re-dosing cells without significant loss of viability. Officials at Mirus Bio say the company developed the TransIT-PRO® Transfection Reagent specifically for high transgene expression levels in suspension CHO and 293 cell types via high-throughput screening screening of the firm’s own internal libraries of lipids and polymers. According to Dr. Juckem, Mirus Bio scaled up to 4 L in a WAVE bioreactor and achieved comparable antibody titers to a 60 mL culture in a 250 mL Erlenmeyer shake flask. She says that the transfection reagent can be used for both transient and stable transfection. Selection of stable populations can be obtained by plating cells by limiting dilution 48 hours post-transfection, adds Dr. Juckem. 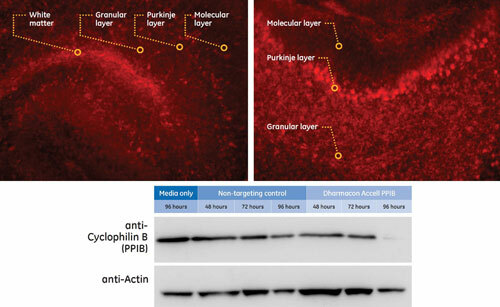 Dharmacon’s Accell siRNA effectively silenced a target gene in cultured brain slices; 250 µm fresh P8 mouse cerebellum slices were incubated in Accell Delivery Media supplemented with Gibco B-27 serum-free supplement containing 1 µM Accell siRNA targeting Cyclophilin B (Accell PPIB) or Accell Nontargeting siRNA #1 (NTC) for western blot analysis or Accell Red Nontargeting siRNA for uptake analysis by microscopy. After 3 and 72 hours of incubation, slices were inspected with a Leica DM IRE2 microscope (filter TX2) 3 and 72 hours post-Accell application. Shutter time: 150 ms (top). Slices were cultured for 48, 72, or 96 hours prior to knockdown detection by western blot analysis (bottom). Tissue was harvested using RIPA-buffer; 50 µg of protein lysate were analyzed per sample.